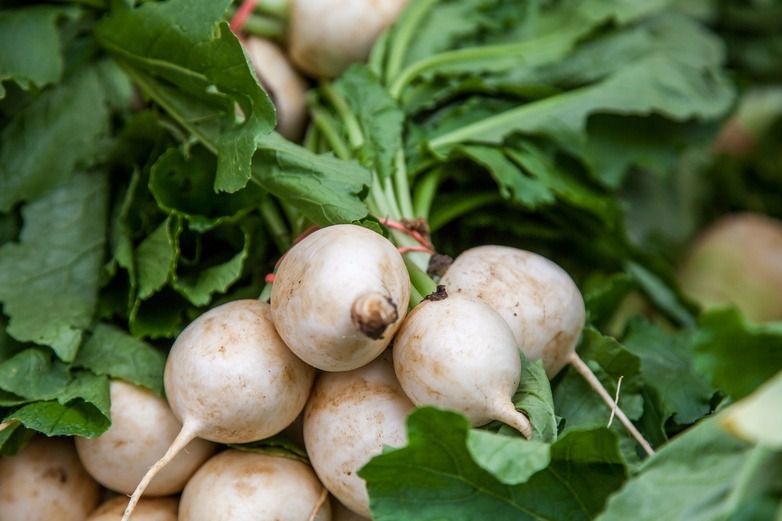 Beets and turnips are beloved for their sweet, earthy roots. The long leafy greens that crown them are equally dinner worthy. So, after using beet and turnip roots for other recipes, don’t let their tops go to waste. Like other greens, such as Swiss chard, a little heat cooks out their vegetal bitterness and astringency to result in tender, silky greens. Slot young, delicate specimens into any recipe that calls for chard or spinach. Put heartier, full-grown bunches to work in addition to or in place of sturdier leaves such as kale. Whether you’re buying turnips and beets at the farmers’ market or at the grocery store, there are questions you can ask to learn more about how they were grown to make the most sustainable choice possible. A simple sauté transforms the leaves into a quick side dish or readies them to be tossed with pasta for an easy weekday meal. Rich, creamy eggs offer a perfect backdrop for the slightly tannic flavor of beet and turnip greens. Try them in an omelet, frittata, or quiche. The tenderest greens can be eaten raw. Tuck them into a sandwich or wrap or make them a salad centerpiece. You can feature both the roots and greens in recipes that use both such as in a stovetop sauté or by boiling the roots and then adding the greens to the mix. Combine some canned or cooked beans with the sautéed greens listed above and use the mixture to top toasted baguette slices. Drizzle with olive oil and few gratings of hard cheese, such as Parmigiano Reggiano, and enjoy as an app or meatless meal. This tart is a shapeshifter. It can be the centerpiece of a weekend brunch. You can serve it alongside a salad for a light lunch. Or it can be cut into two-bite squares and passed as an hors d’oeuvre. Sauté the greens. In a medium sauté pan, sauté the onion, seasoned with salt and pepper, in the olive oil over medium heat until translucent, about 5-7 minutes. Add the greens and sauté until tender, about 3-5 minutes. Set aside. Blend the goat cheese. Combine the goat cheese, garlic, cream or yogurt, minced thyme in a medium bowl and use a fork to blend the ingredients together until smooth. Season with salt and pepper. Set aside. Make the dough. If using a food processor, add the flour, salt and butter to the working bowl and pulse until the mixture looks like wet sand with pea-sized pieces of butter mixed in. Add the water in a slow drizzle, pulsing all the while. Continue to pulse until the dough forms a ball. If you are not using a food processor, combine the flour, salt and butter in a large bowl. Use a pastry blender or two knives to cut the butter into the flour until it reaches the texture described above. Slowly work in the water until the dough forms a ball. Assemble the tart. Transfer the dough to a lightly floured surface. Roll it out to about a 1/4” thickness creating a round or oblong shape. Transfer the dough to a cookie sheet lined with parchment paper. Use an offset spatula or the back of a spoon to spread the goat cheese mixture over the dough, leaving a ¼” perimeter around the edge. Strew the greens mixture on top of the pastry. Bake until the crust is golden, about 20-25 minutes. Garnish with fresh thyme sprigs. Serve warm or at room temperature.